They are cutting in half the 3% increase in social assistance rates scheduled to come into effect in September this year. Progressive changes to regulations scheduled to be implemented this fall have also been “paused,” and will likely be canceled. A series of sweeping changes to social assistance are currently under review and will be announced within the next 100 days. The scheduled 3% increase passed by the Liberals was woefully inadequate, but it would have marked the second time in almost a quarter century that social assistance income would have risen above the rate of inflation. Instead, the 1.5% cut will yet again plunge social assistance below the rate of inflation, making social assistance recipients even poorer. 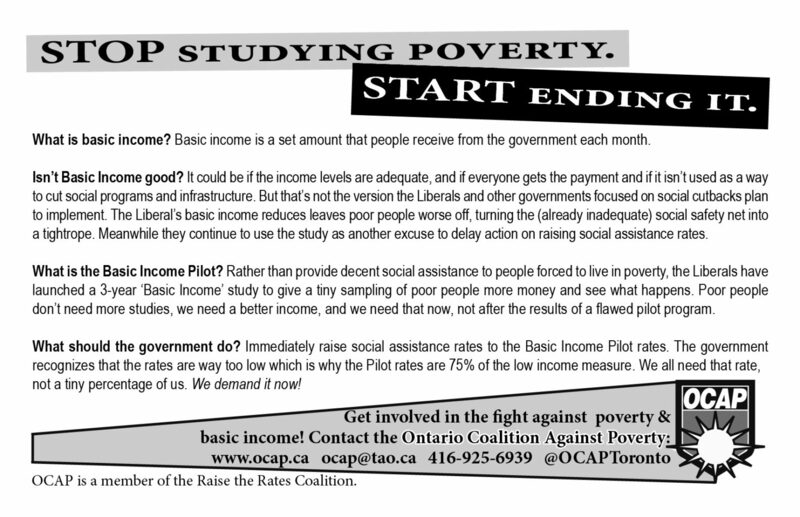 We have been critical of the Basic Income pilot project, but canceling the pilot a year after it was underway demonstrates a reckless disregard for the lives of nearly 4000 people on the pilot who planned their lives on the assurance of having a set income for 3 years, and who must now scramble. The sweeping changes to social assistance that are being ominously hinted at are likely to be the same brand of ruthless right-wing reforms we saw under Mike Harris. We can expect dramatic restructuring of social assistance that cuts supports, forces those on social assistance, including disabled people, into the most exploitative jobs, and increases punitive surveillance and “fraud” crackdowns of the poorest people in this province. Clearly, this is the war on the poor component of the Doug Ford agenda of neoliberal austerity. The Tories are forging a punishing regime of social abandonment that creates misery and utter desperation. It is the cutting edge of their attack and a compelling reason why we must unite and build a movement to defeat this Government and all it stands for. Doug Ford is now Premier of Ontario and a hard right, class war Tory Government is in power. Our message is that their agenda of austerity, war on the poor, attacking workers’ gains, targeting migrants, gutting public services, racism, bigotry, environmental degradation and trampling on Indigenous rights, is inevitable only if we allow it to unfold without mounting the kind of real resistance that can bring it to a halt. Comparisons are made to the Tory Governments in Ontario from 1995-2003. Let’s be clear that Ford represents something far worse. The international austerity agenda is far more advanced than during those years. We have also gone through fifteen years of ‘progressive’ Liberal cutbacks that have left their mark on public services like healthcare, ensured that people on social assistance are poorer than when the Tories left office and produced a housing and homeless crisis of terrible proportions. Frankly, there is very little flesh for Ford’s knife to cut into. It will be going into the bone. When the Tories last held power, there was a powerful mobilization against them but it failed to stop them because it was held back by disunity and a failure to take things to the level necessary to win. 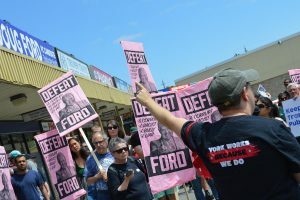 A creature like Ford will not be stopped by moral arguments or token protest. A movement that creates serious economic disruption and a political crisis is what is needed. The Tory agenda must be blocked by a struggle that makes the Province ungovernable. On June 16, Fight for $15 and Fairness will be rallying at the Ministry of Labour in Toronto. We should all work to build this action and use it as a springboard for Ontario wide resistance. OCAP is talking to allies about convening an Assembly to bring together those who want to fight back decisively. The most vital thing is that we must not let the Tories gain the initiative by remaining passive as they start their attacks. Ontario is about to became a key site of struggle. We have the chance to demonstrate to the world that a vicious hard right austerity regime can be defeated by creating a model of resistance of enormous importance. Unless we want to go down in defeat at the hands of a gang of Tories headed up by a scandal ridden buffoon, we must be ready to fight to win and bring together a movement that can empty the workplaces and fill the streets. Bus information: The rally location is accessible by the TTC, but it’s nice to get there together. We have two buses and two pick up locations – one outside St. George station (Bedford exit) and another at Allan Gardens (Sherbourne/Carlton). If these are on-route for you, then please sign up here and come with us. If not, we’ll see you there. 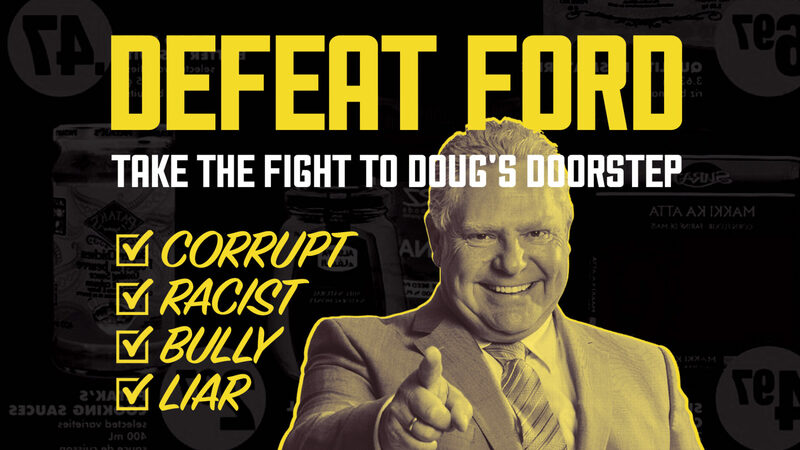 Doug Ford is a corrupt multi-millionaire whose party’s record is one of destroying Ontario’s public services, increasing poverty, and intensifying racism and bigotry. A Ford government promises corporate welfare and tax-breaks for the rich, and service cuts for the rest of us who depend on public hospitals, education, roads, transit, income support and decent jobs. We believe the only way for the struggling people of this province to win is to build determined social movements capable of taking on whoever gets in power. 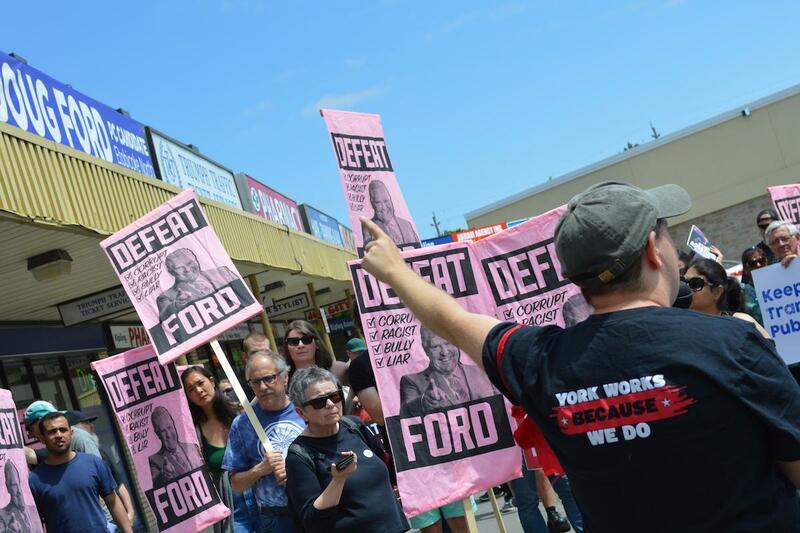 Ford would take the ongoing attack on poor and working class people to a new level, and so a resistance movement powerful enough to confront and defeat him must be built. Support for Ford is slipping but a hard-right government led by the Conservatives remains a serious possibility. 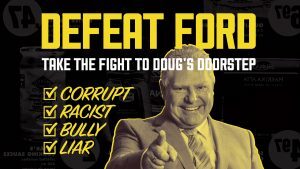 So join us on June 2 to demonstrate opposition to Ford’s agenda and to give him a preview of the resistance that awaits him should he become Premiere of Ontario. #FightToWin. Many of you have been a part of the struggle to change the discriminatory policies underlying the Housing Stabilization Fund (HSF). To-date we have written two reports (accessible here and here) documenting in detail the issues with the HSF and its management. The outrage sparked by Laura Bardeau‘s case and the subsequent mobilization led to series of changes being announced by the City in December last year. Some of these changes were implemented immediately, such as the abandoning of the discriminatory eligibility formula, whereas others, we were promised, would be designed in consultation with us and other community advocates and legal clinics. The consultation did not happen and instead TESS merely notified us, by way of a poorly organized ‘information session’ on June 28, of the changes it had already designed and which would go into effect a mere 3 business days later (on July 4). Now a coalition of 18 organizations, OCAP included, have penned an open letter to the Mayor and members of the Community Development and Recreation Committee outlining the issues with the changes and the resolutions we are seeking. The letter appears below. OCAP has also prepared our own assessment of all the changes to the HSF. You can download it here. 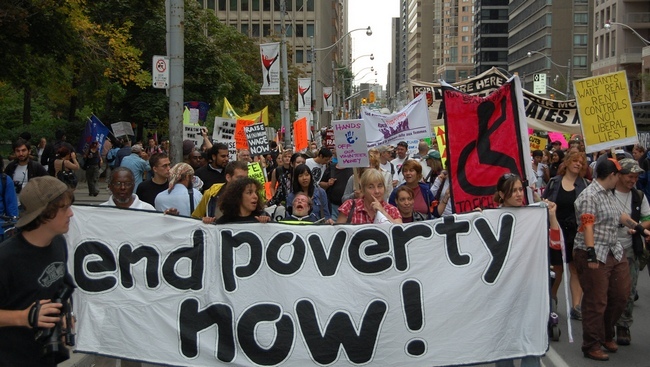 Disabled people in Ontario are much more likely to experience poverty than non-disabled people. 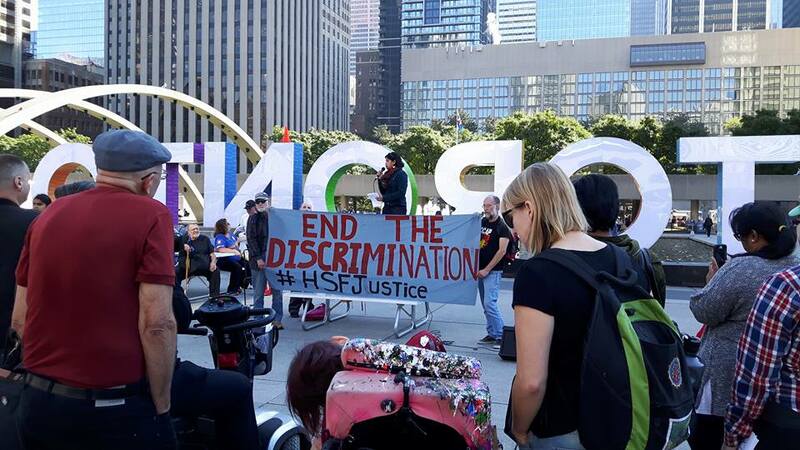 Many have to live on sub poverty payments under the Ontario Disability Support Program (ODSP) or the even more wretched income provided by Ontario Works (OW). Those that are in this situation are confronted by an ongoing process of surveillance, invasion of their privacy and moral policing. Those disabled people who are working, because of systemic discrimination, are less likely to be receiving living wages and are far more likely to be precariously employed. As anti poverty organizers, we fully understand the anger and desperation that such a situation generates.